One of the last Ford Mustangs to lap the Nordschleife in anger in contemporary competition was probably one of the late-80s DTM cars; now the Mustang is set to return to Germany, with a difference. While MCS Racing from Luxembourg is advertising drives with a conventional V8-powered example, its other car will be (and there is no way of breaking this gently to you Ponycar fans out there) - a diesel. German rapper Smudo’s Fourmotors team has run a TDI-powered, bio-diesel fuelled Beetle in the alternative fuels class at the ‘Ring for the last few years; in 2006, the bio-fuel project continues, but the Volkswagen is a thing of the past, to be replaced with the new retro-shaped Mustang, and a diesel engine of as yet undisclosed proportions under the bonnet. And that bonnet is different, too. 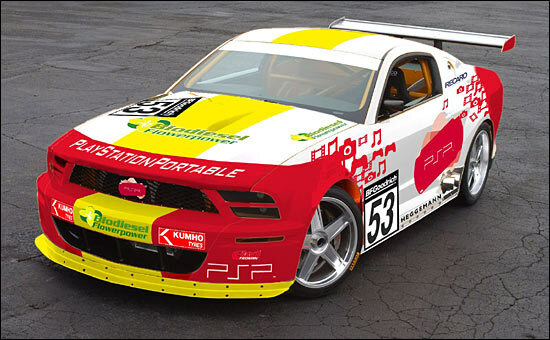 To quote the team’s press release, “in 2006 Smudo's racing vehicle will not only be driven by renewable raw materials, but also constructed in part using biogenous materials.” In other words, this Mustang has “a vegetable-based bodyshell” – they call it the Bioconcept Car. Why a Mustang? “With respect to the environmental approach of the project, only racing cars from manufacturers who credibly represent the topics of racing and commitment to the environment will be considered,” says the team’s press material. The project is supported by "sponsors who showcase themselves in a timely and established manner via the combination of "young artist – young cult-auto – young lifestyle“: read PlayStation 2, Kumho, Flowerpower Biodiesel and Red Bull. A projected 290bhp at a weight of only 1000kgs should give its immediate, alternative-fuelled, competitors something to worry about. More technical details will be known over the coming weeks, but as the first renderings show, there are some high-profile partners from the entertainment world involved, as befits a team with connections to the music industry. The German government is in on the project, too, providing support through the Professional Agency of Renewable Raw Materials (FNR), which – in case you were wondering - is subordinate to the Federal Ministry of Consumer Protection, Nutrition and Agriculture (BMVEL). Scientific backup comes from the German Institute for Air and Space Travel. So if this Mustang looks retro, under its bio-fiber body it is anything but.